During its approach to Mimas on Aug. 2, 2005, the Cassini spacecraft narrow-angle camera obtained multi-spectral views of the moon from a range of 228,000 kilometers (142,500 miles). This image is a narrow angle clear-filter image which was processed to enhance the contrast in brightness and sharpness of visible features. Herschel crater, a 140-kilometer-wide (88-mile) impact feature with a prominent central peak, is visible in the upper right of this image. This image was obtained when the Cassini spacecraft was above 25 degrees south, 134 degrees west latitude and longitude. 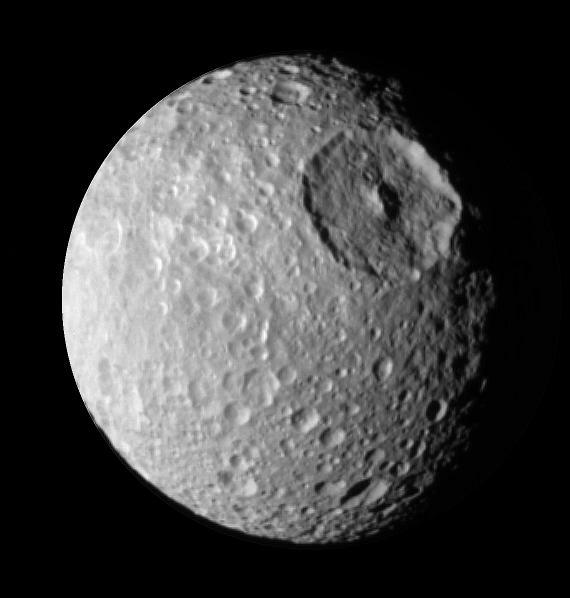 The Sun-Mimas-spacecraft angle was 45 degrees and north is at the top.